What does it do? What does it cost? In January 2017, a revised 421-a Tax Exemption, rebranded and given the title “The Affordable New York Housing Program,” was introduced and inserted into the proposed FY18 New York State budget. This version of the 421-a Tax Exemption is essentially an expanded and amended version of the expired June 2015 exemption that passed the legislature but with modifications intended to resolve the conflict created from a trade union wage provision that was inserted at the last minute, which subsequently led to legal complications and suspension of the exemption. REBNY’s proposed 421-a program does not improve or change any of the affordable housing requirements passed by the legislature in June 2015. 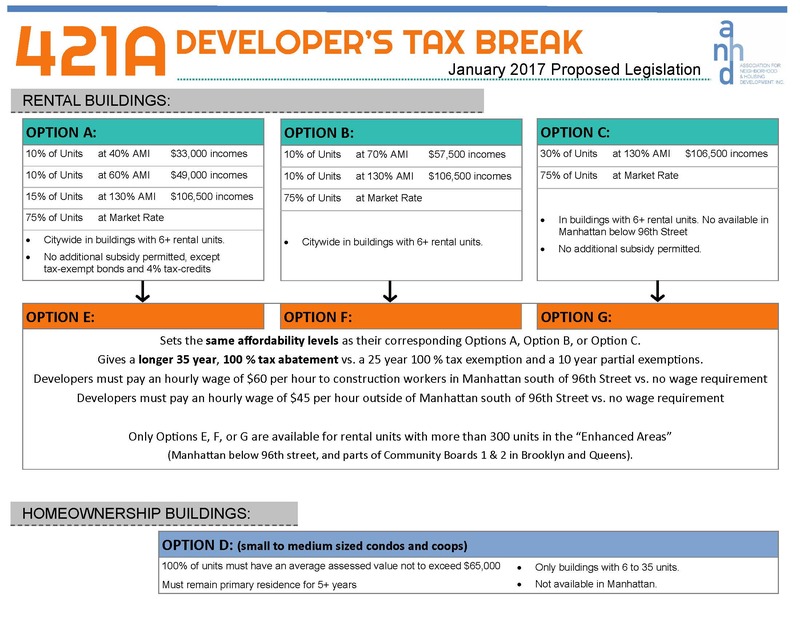 The June 2015 version was citywide and would have been used by almost all new residential development projects over 6 units, allowing developers affordability Options A, B, C, and D. (See image below for an explanation of the Options) The new REBNY proposal adds Options E, F, and G and requires developers to pay higher construction wage levels. The new Options E, F, and G also extend the length of the tax exemption to an unprecedented 35-year, 100% exemption. This is a major increase in the lifetime value of the exemption to the developer and a major increase in the cost to the New York City taxpayer. The proposed new REBNY program is citywide, and would be widely used across most neighborhoods. Development of new buildings with 300+ rental units will be required to participate in the program in some areas, and eligible to participate in all other areas of the City. The new program is exceptionally generous to the developer, and most will take advantage of this financially generous opportunity. What is the Cost of the REBNY Proposal? The NYC Independent Budget Office recently reported that the current “421-a remains the city’s largest tax expenditure at $1.4 billion this fiscal year.” New York City’s Department of Housing Preservation and Development (HPD) has stated that the REBNY’s proposed changes will increase the overall cost of the program by yet another 22% on top of the billion-plus dollars we are already spending on the program every year. And the increase in cost won’t just come after year two of the extended tax exemption; it will come immediately. Developers will find the enhanced benefit irresistible since it allows them to not pay taxes for an additional ten years. We will see a rush of developers applying for REBNY’s 421-a program and see developments from the last 1.5 years retroactively being granted 421-a, costing tax payers an estimated additional $820 million in the first ten years, according to HPD. Is 421-a an Affordable Housing Program? Although the current 421-a Tax Exemption includes some requirements for affordable housing, it cannot be accurately described as an affordable housing program. It was designed in the 1970s to incentivize the creation of private, market-rate, and luxury housing at a time when the City economy was stagnant. The affordability benefits were a minor, late add-on the program. In fact, a 2014 analysis of the annual cost by ANHD shows that the exemption cost the City over $1.1 billion in lost tax revenue and covered 152,402 residential units, but only 12,700 of those units were affordable. That’s $11 of affordable housing benefit taken for every $100 given away to subsidize luxury development. That’s not an affordable housing program. Who Will Benefit from the REBNY Proposal? No additional affordable units, or deeper level of affordability will be generated by the REBNY proposal, and the increase in the length of affordability is minor. The primary beneficiaries will be market-rate and luxury real estate developers, who will have their already substantial public subsidy increased by an estimated 22.5% in each new building. A fraction of the increased value that is given to the developer will be passed along in the form of higher wages for the short-term construction labor, but this will be a minor amount. Additional beneficiaries of the REBNY proposal will be landlords and politicians who oppose rent stabilization laws. The New York State Assembly, which tends to support rent stabilization laws, has often used the threat of not renewing 421-a as leverage to prevent the weakening of rent stabilization laws by the New York State Senate, which tends to support the 421-a Exemption. Since this version of 421-a included a higher construction wage for the first time, the Assembly – which tends to also be pro-organized labor –will find it far more difficult to use the threat of not renewing 421-a as leverage. How Do the New “Options” Work? Option E is allowed within any of the Enhanced Affordability Areas, and requires 10% of the apartments be affordable at 40% of Area Median Income (AMI), 10% at 60% of AMI, and 5% at 120% AMI. The average hourly construction wage must be $60. Additional public subsidy is not allowed. Option F is allowed within any of the Enhanced Affordability Areas, and requires 10% of the apartments be available at 60% of AMI, and 20% at 130% AMI. The average hourly construction wage must be $60 an hour. Additional public subsidy is allowed. Option G is allowed only within the Brooklyn and Queens Enhanced Affordability Areas, and requires that 30% of the new housing is affordable at 130% of AMI. The average hourly construction wage must be $45 an hour. Additional public subsidy is not allowed. Any building with 300+ rental units outside of the Enhanced Affordability Areas can opt-into Option G, which, given the extraordinary value of the 35-year 100% abatement to the developer, is the most likely outcome.